Fort Thomas resident Jo Alexander is part of a tale of friendship in this new book. In 1964 Jo (Diffey) Alexander traveled from a small town in eastern Arkansas to Danville, Ky., with her parents. She had been accepted as a freshman to study English and education at Centre College, a small liberal arts college. 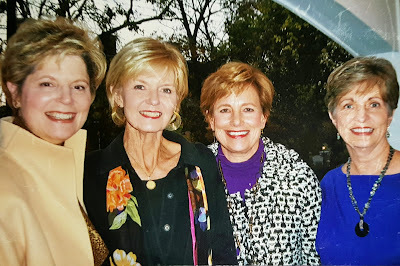 In a matter of days, Jo became friends with six other women: Lindy, Leslie, Carol, Judy, Pam (who no longer lives in Fort Thomas but gradated from Highlands High School) and Libby. For 40 years following their time at Centre, these women lived their lives, only sporadically staying in touch. Then, tragedy struck. Libby was diagnosed with terminal cancer. In the beautiful/awful way that life works, the tragedy brought these women back together. 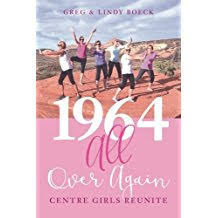 They now take yearly trips and their lives, at Centre, in the middle years, and the years following Libby's death have been documented in a new book: 1964 All Over Again: Centre Girls Reunite by Greg and Lindy Boeck. The book begins in 1964, and paints a picture of the women's lives their freshman year at Centre: Villager dresses, Bass Weejuns penny loafers, strict rules for women (who were allowed four dates a week and had to comply with dinner dress codes), $1 pizzas from Freddies, hair curlers, hair dryers, studying and playing bridge. Their sophomore year was a bit more eventful. Many of the women transferred at the end of 1966, for various reasons. The book then delves into individual biographies—each of the women wrote her own. Jo married Ken Alexander in 1968. Ken grew up in Bellevue and Fort Thomas, and graduated from Highlands High School in 1963. He and Jo met at Centre. They had three children: Laura, was born in 1971, Mary Claire in 1974 and Sarah in 1979. Ken joined the Federal Bureau of Investigation in 1969, and together they moved around as his job required, eventually landing in Fort Thomas in 1978. They still live here today, as do their three grown daughters and nine of their 10 grandchildren (one is in college). Jo was always involved in the community, and in her 40s earned her Master's degree at Northern Kentucky University and was hired as a teacher at Newport High School. Later she worked as a librarian at Mildred Dean Elementary in Newport. She retired in 2008. Libby was diagnosed with stage 4 uterine cancer in 2006. 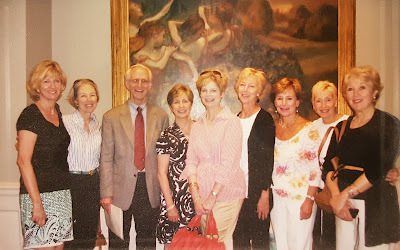 In September 2007, all the women—some of whom hadn't spoken to each other in years—met at Beaumont Inn in Harrodsburg, Ky. Since 1919 the Inn had been owned by Libby's family. In the book, Jo is quoted as saying: "I didn't need to do this," recalled Jo, who already knew first hand Libby's struggles with cancer. "But I didn't know just how important it would be to me. On that weekend, we didn't concentrate on her illness. It was barely brought up. What was brought up was the celebration of life. Our past lives. Our present lives. Our future lives together." Libby died in 2008. Greg and Lindy wrote that her death, though, was the beginning of a new chapter. "We knew there was going to be a future," Jo says in the book. "To help heal our sorrow, we wanted to see each other again." Jo Alexander reunited with her Centre College friends. And they did. And they have. In addition to attending Centre College's reunion each year, they've traveled together to Washington D.C.; the Grand Hotel on Mackinac Island in Michigan; Leslie's lake house; Lindy's home in Arizona; Beaufort, S.C.; Utah; and Franklin, Tenn. In June they are all meeting up in New Mexico. For Jo, the book serves as a trip down memory lane, a testament to the importance of friendship and a record of her life, which, perhaps, generations later will enjoy. Fort Thomas resident Ann (Johnson) White sent an email to her former Highlands classmates. "Two of the girls will be familiar to you—Pam Racke [Rogers] (a year behind us in school) and Jo Alexander (Ken's wife)," Ann wrote. "I couldn't put it down, and when I finally did, my husband picked it up and read it through. In addition to familiar landmarks and traditions, the book puts your right back in the classroom, the dorm, those first relationships, spring break in Florida. It's all there." Fort Thomas resident Maggie Rice sent Jo a handwritten note that, in part, said, "I laughed and cried and it reminded me so much of my own experiences at the 'Camelot Bubble' of Hanover College. ... It was such an enjoyable story of lovely young girls who, shaped by life experiences—good and bad—have matured into awesome women. That ongoing friendship must be such a treasure. Thanks for sharing the book."